Carpal Tunnel Syndrome is a condition that results from a compression of the median nerve as it passes through the carpal tunnel at the wrist. It results in numbness and tingling in the first three fingers of the hand. It is the most common nerve entrapment of the arm and located at the wrist. 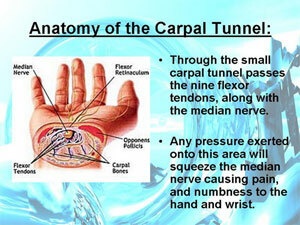 If you have any questions about Carpal Tunnel Syndrome contact our staff at Dynamic Physiotherapy. Booking an appointment is easy. You can use our link online and someone will respond back shortly, or by calling directly to the location of choice and an appointment can be set relatively quickly (Sometimes even the same day).